Ohio State Highway Patrol Trooper Marvin Pullins receives his award. 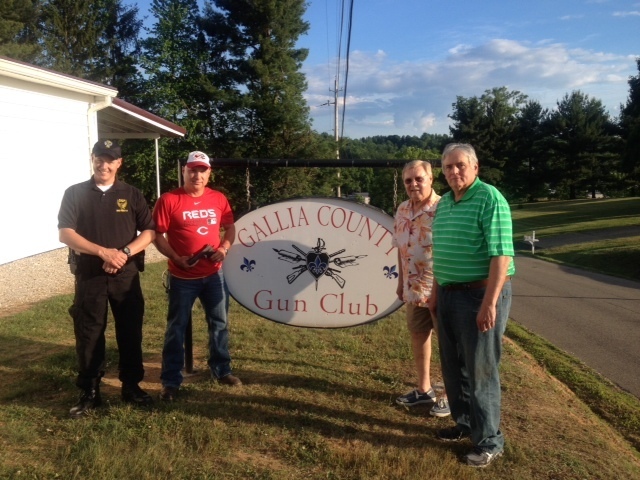 Pictured, from left, are Gallipolis post commander Lt. Max Norris, Pullins, Gallia County Gun Club President Bill McCreedy, and Gallia County Gun Club member Tom Meadows. OHIO VALLEY — The Gallia-Meigs Ohio State Highway Patrol Post officials said Thursday that one of their own, Trooper Marvin L. Pullins, received the Gallia County Law Officer of the Year Award from the Gallia County Gun Club. Pullins’ hard work during the year qualified him to be put in the running with top law enforcement officers in area agencies. On June 5, the Gallia County Gun Club hosted an appreciation dinner for area law enforcement with approximately 100 in attendance. During the dinner, Pullins was presented with the Gallia County Gun Club Sgt. Dale Holcomb Memorial Award, which is an engraved handgun. After the dinner, law enforcement also competed in a handgun combat course competition in which the Ohio State Highway Patrol team received first place.